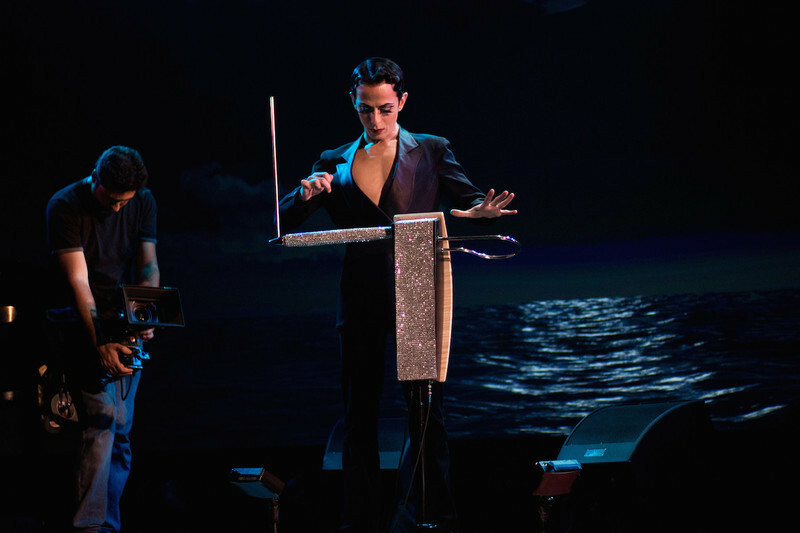 So the thereminist Armen Ra describes his artistic evolution, in an interview a week before a documentary on his life and art, “When My Sorrow Died: The Legend Of Armen Ra & the Theremin” opens for a week's engagement in New York City, November 13-19, at downtown’s Cinema Village. Now would probably be a good time to own up that this movie affects me personally beyond my disinterested critical eye. Armen is an old and dear friend of mine, and there’s even some archival footage shot by me in the film. So you may take my recommendation of the film with a grain of salt if you wish, although I do think it is very good indeed … but … well, I didn’t think that my connection to Armen would preclude an interview, so I arranged to speak with Armen and the film’s executive producer Matt Huffman, now in New York for the run-up to the movie’s opening here. 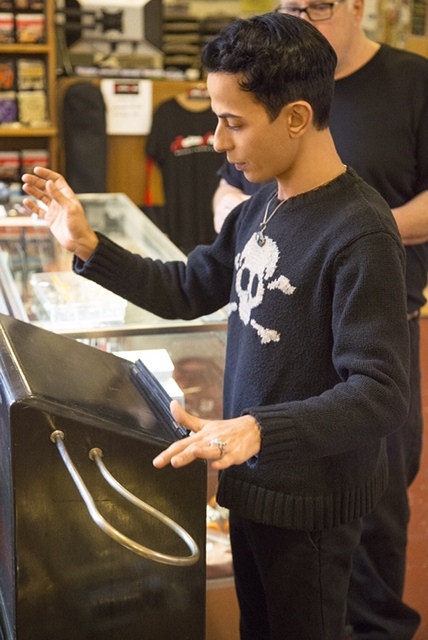 (Matt’s an L.A. native, while Armen has lived on the West Coast for about a decade now.) 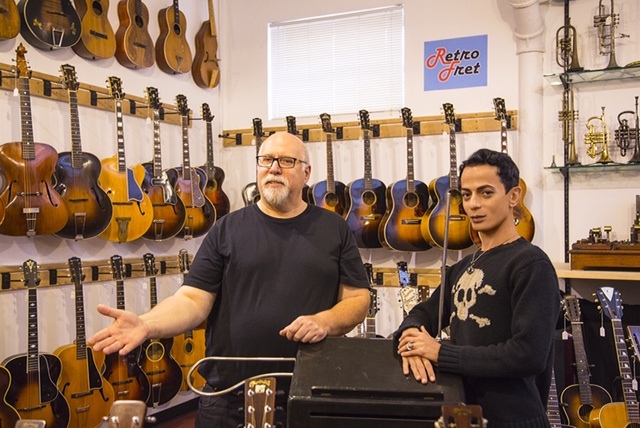 We met at the vintage music shop Retrofret (that's Retrofret proprietor Steve Uhrik with Ra in the picture below) which has a vintage Theremin—built by the instrument’s inventor Leon Theremin himself—on the shop floor, which Armen sampled before we got to talking. When My Sorrow Died_TRAILER_V5.0.1_web from The Karmic Avengers on Vimeo. Next Article: Movies Are My Medication: Josh Mond and Christopher Abbott on “James White” Previous Article: We Watch Films with Our Nervous Systems: Sebastian Schipper on "Victoria"